Part Twenty-six of a history of European occupation, rule, and brutal imperialism of Indigenous Australia, by Dr George Venturini. Located in Berrimah, an Indigenous word which in Yolngu means ‘to the south’, in fact east of Darwin, is the Don Dale Youth Detention Centre, a facility for juvenile detention in the Northern Territory. It is actually a maximum security prison for male and female regarded as juvenile delinquents. The prison is named after Don Dale, a former Member of the Northern Territory Legislative Assembly from 1983 to 1989 and one-time Minister for Correctional Services. The Centre is managed by the Northern Territory Correctional Services. ‘Correctional Services’ is a euphemism often used in Australia. Don Dale Youth Centre revealed itself in time as a place of torture. The Centre had been built in 1991 to detain young male and female offenders from across the Northern Territory. It provided ‘medium and high level’ detention, usually in single cells. At Don Dale, in the early evening of 9 February 2000 Johnno Johnson Wurramarrba, a 16-year-old Indigenous boy, had been found in his assigned room with a sheet tied around his neck. He was taken to the Darwin Hospital, and there he died on the subsequent night. The Indigenous youth had been sentenced on 18 January 2000 by the Juvenile Court sitting at Alyangula to serve a period of 28 days detention under the Juvenile Justice Act for stealing some oil and paint from Angurugu School on Groote Eylandt. The death was properly categorised as a death in custody as he was a “person held in custody” within the definition in s. 12(1)(a), (b) and (c) of the Coroners Act 1993 (NT). A Coronial Inquiry into the circumstances of the death resulted in a number of recommendations being made relating to training of staff and management practices in the centre. Nothing came out of those recommendations. Two and half years later, on 25 July 2016, the A.B.C. broadcast a Four Corners report, titled ‘Australia’s shame’, which disclosed the systematic abuse of youths in the Northern Territory ‘corrections system’ and would lead to the Royal Commission into Juvenile Detention in the Northern Territory. As the A.B.C. report revealed, in August 2014 six boys were in solitary confinement cells in the Behavioural Management Unit. One boy walked out of an unlocked cell, and beat on a locked reinforced door. The staff considered that there was a ‘riot’, and released tear gas into the hallway, gassing all six boys. It took up to eight minutes to rescue the boys in their cells from the tear gas. A news release to the media falsely asserted that six boys had escaped from their cells, despite CCTV in the hallway showing only one boy in the hallway. The incident, among others, was investigated by the Northern Territory Children’s Commissioner Colleen Gywnne in a report provided in August 2015 to the then Corrections Minister John Elferink. The A.B.C. report, which included the 2014 tear gas incident, was later in the year televised worldwide. Teenage boys were shown being assaulted, stripped naked and tear-gassed. They were being held in isolation up to 72 hours with no running water. The programme also showed a 17-year-old boy shackled and hooded in a chair at a facility in Alice Springs. At this point the Office of United Nations High Commissioner for Human Rights, Zeid bin Ra’ad Zeid al-Hussein, let it be known that he was “shocked” at the “appalling treatment” of the detainees, which violated the Convention against Torture and Other Cruel, Inhuman and Degrading Treatment, to which Australia is party. Global broadcast of the documentary caused worldwide astonishment about the inadequate actions of the minister. Prime Minister Malcolm Turnbull was forced to announce a Royal Commission into Juvenile Detention in the Northern Territory. ‘Corrections’ Minister John Elferink was dismissed the morning after the programme was aired. The corrections and justice portfolios were taken on by Northern Territory Chief Minister Adam Giles. Only then, the use of restraint chairs and spit-hoods, a mesh hood used by police officers to stop suspects spitting at them, was suspended. Chief Minister Giles may have been wrong with recent media investigations (ABC news, 20 March 2017) showing systemic sexual abuse of children of both genders, systemic abuse by guards, including physical, sexual and emotional abuse; and a lack of governance oversight which ensured a permissive culture of guard entitlement to treat vulnerable children as play toys for their own gratification. Four Corners had managed to track down several of the boys who were tear-gassed. They described being highly distressed, afraid for their lives, and said that two years after the events they are still suffering from disturbing flashbacks and nightmares from the ordeal. The CCTV vision also showed the children’s reactions as they were affected by the gas, running to the back of their cells, hiding behind sheets and mattresses, gasping for air, crying, and bending over toilets. One boy was left in his cell and exposed to tear gas for eight minutes. He was seen lying face down on the floor with his hands behind his back, before being handcuffed by two prison officers wearing gas masks and dragged out of his cell. The use of tear gas at the Don Dale Youth Detention Centre in 2014 came after months of tension, repeated escapes and incidents at the Centre, which was staffed with under-trained youth justice officers, in what has been described as a ‘ticking time bomb’ by former staff. Three weeks before the tear-gassing incident, five boys had escaped from the Centre. When they were recaptured, they were placed in the isolation wing of the prison for between 15 and 17 days, in what were described by both children and staff as appalling and inhumane conditions. They were kept locked in their cells for almost 24 hours a day with no running water, little natural light, and were denied access to school and educational material. The boys being kept in isolation were accidentally discovered by a group of lawyers, including Mr Jared Sharp, a solicitor, when they were taken on a tour of the facility in August 2014. “We all sort of looked at each other in shock that there was kids in these cells, because there was signs of life in there but we didn’t know who was in there or what was happening, or how long they’d been there.” Mr. Sharp told Four Corners. “To what extreme is that, is to my view is torture. To my view that is treating kids in a way that is just entirely unacceptable,” he said. Ms Ruth Barson (Masters of Laws (criminology) from the University of Sydney and Masters of International Human Rights Law from the University of Oxford) of the Human Rights Law Centre said that the isolation of the children was a clear violation of the United Nations Convention against Torture. 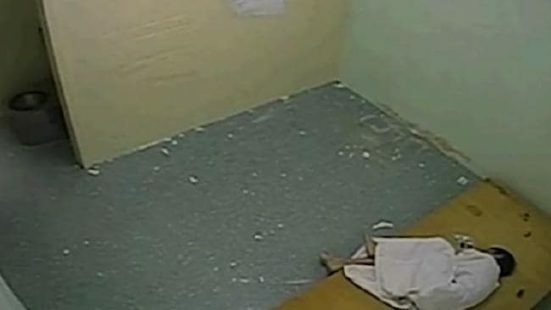 “The UN’s expert on torture has said there are no circumstances that justify young people being held in solitary confinement, let alone prolonged solitary confinement,” Ms Barson told Four Corners. In the days after the tear-gassing, Corrections Minister John Elferink praised the actions of his staff and the prison security dog used on the night of the incident. “I congratulate again, and place my support behind, the staff who made this decision. The staff worked hard, ‘Fluffy’ the Alsatian worked hard and, as far as we are concerned, it was a problem that was solved quickly,” Mr Elferink told Parliament. In the wake of the incident the Don Dale Centre was closed and the children were moved to the run-down, old Berrimah adult prison. The Northern Territory Government commissioned an independent report into the incident by former Long Bay prison boss Michael Vita, which was released in January 2015. Northern Territory Children’s Commissioner Colleen Gwynne confirmed to Four Corners that there were still unresolved problems with youth detention in the Northern Territory, with many of her 2015 report recommendations still not implemented. “The response has not been as urgent as we would have liked. The issues raised in that report are extremely serious and I would like to see a more full response,” she said. “[We need] some urgency and some dedicated resources thrown at this.” (Evidence of ‘torture’ of children held in Don Dale detention centre uncovered by Four Corners, by Caro Meldrum-Hanna and Elise Worthington, 21 July 2016, A.B.C.). In the view of Mr Juan E. Méndez, an Argentine lawyer, who was at the time United Nations Special Rapporteur on Torture and Other Cruel, Inhuman or Degrading Treatment or Punishment, and a human rights activist known for his work on behalf of political prisoners, treatment of children at Don Dale prison could amount to torture. (Treatment of children at Don Dale prison could amount to torture, says UN, 28 July 2016, The Guardian). Public officials who covered up the acts at the Detention Centre could also be guilty of torture, but – of course – it would have been up to Australia to prosecute those involved. He said the acts committed against the children at Don Dale could have made up the elements of the international crime of torture but it would be up to Australia to prosecute those involved. Whether it puts Australia in violation of its international responsibilities, he said, depended on the government’s response. Mr Méndez said that it was “encouraging” that the Australian government had moved swiftly to establish a royal commission into both the abuse and the alleged cover-up of abuse. Speaking on the A.B.C.’s Q&A programme after Four Corners had aired shocking footage from the Don Dale Detention Centre, Professor Gillian Triggs, then Human Rights Commission president, said that treatment of teenagers at the Centre was a manifestation of wider acceptance of detention practices in a regime of “ increased detention without trial” in the whole country, citing as an example Australia’s “unique” immigration policies which mandate, as a first resort, the indefinite detention of children and families who arrive in Australia by boat seeking asylum. Professor Triggs endorsed calls for the matter to be independently investigated, with a view to charges being laid against those responsible. But she argued that the brutalisation of children was not an isolated incident. She added that she felt “absolute horror” watching the footage. The youngest of the boys was 14. “If one of us were to have been found to have treated our children in this way we would probably be charged with a criminal offence and the children taken away from us. It’s an extremely distressing piece of footage to look at and I have visited many detention centres, sadly, but I have never seen conditions of that kind and I have never seen people treated in that way. I think it’s something that, as the experts were calling for, we clearly need some kind of investigation into this,” Professor Triggs said. Professor Triggs said that a government-based independent commission was needed to establish the facts of the children’s abuse. Some of the boys assaulted in the Don Dale juvenile detention centre were Indigenous. Ms Shireen Morris from the Cape York Institute said that Australia had become “used to accepting low standards when it comes to Indigenous kids.” … “These kids are born with worse life chances than the rest of us and they end up in detention like that, getting treated as they do, and as one of the lawyers said in the program, it is consigning them to no future.” (Northern Territory abuse reflects Australia’s detention culture, says Gillian Triggs, 26 July 2016, The Guardian). Prime Minister Malcolm Turnbull acted quickly and was set to release the terms of reference for the commission after a cabinet meeting on 28 July 2016. He had already said that the inquiry would be restricted to the Northern Territory, despite calls from Indigenous and Torres Strait Islander leaders, lawyers, and Professor Gillian Triggs, of the Australian Human Rights Commission, that the inquiry start with the events at Don Dale and be broadened to include juvenile justice centres in other states. Labor senator for Western Australia Patrick Dodson, who was one of the commissioners in the 1989-91 Royal Commission into Aboriginal Deaths in Custody, said that the inquiry “should look at how systemic practices pertain across all jurisdictions”, and should also look at how children ended up in detention. The Minister for Human Services, Alan Tudge, said that it was up to other states to initiate their own inquiries if they believed they had similar issues. On 28 July 2016 the Governor-General issued Letters Patent to establish a Royal Commission into the Child Protection and Youth Detention Systems of the Government of the Northern Territory, and appointed the Hon. Brian Ross Martin, A.O. Q.C. as Royal Commissioner. The quick choice will remain as testimony of the combined wisdom of two prominent Oxonian lawyers. The chosen Commissioner was thought to have a deep understanding of the legal and justice systems of the Northern Territory, and deep familiarity with issues arising from the engagement of Indigenous People with criminal justice and penal systems. In 1991 he acted as Senior Counsel assisting the Royal Commission into the Commercial Activities of Government and Other Matters, known as ‘W.A Inc.’ In 1997 he was appointed the Commonwealth Director of Public Prosecutions. He had served in that role until he was made a judge of the Supreme Court of South Australia from 1999. In 2004 Justice Martin was appointed Chief Justice of the Supreme Court of the Northern Territory – a role he served until 2010. He was an acting Judge of the Supreme Court of Western Australia in 2012. The Royal Commission was to be conducted jointly with the Northern Territory Government which was to issue an appointment in identical terms under its Inquiries Act. The Royal Commission was also to make recommendations about legal, cultural, administrative and management reforms to prevent inappropriate treatment of children and young persons in detention, and what improvements can be made to the child protection system. The Royal Commission was due to report by 31 March 2017. The Commission submitted an interim report by that date. (The interim report did not deliver any findings or make any recommendations. Nor did it reflect young people’s personal stories). By the end of August 2017, when the final report was due, the Commission was granted another extension, the third one. The Report of the Royal Commission and Board of Inquiry into the Protection and Detention of Children in the Northern Territory was tabled in Parliament on 17 November 2017. They are brave souls who speak out about human rights in the face of this authoritarian LNP government. George Venturini is one such. This series is not pleasant reading but it should be essential reading. Gillian Triggs is another incorruptible soul who speaks for the protection of our human rights. Her treatment at the hands of the LNP regime shames Australia. Agree with Phil, and it is good to see this insightful analysis. At the root of this issue (State brutality) are politicians who have no inclination to implement ideas that are progressive. This failure probably relates to a petty desire to cling to a self-image of themselves as financial genius / tough guy / intellectual giant / public celebrity. Being trapped in self-adulation and privilege, politicians view change as dangerous. In that they are correct, change is dangerous to self-delusion. “A society should be judged not by how it treats its outstanding citizens but by how it treats its criminals”. If the justice system is to work properly, then rehabilitation needs to become the central goal. The solution lies in understanding how to treat or ‘correct’ errant psychology. We ban tear gas in war but not in the confined spaces of prisons. Does that tell you something about our politicians?